While in Florianopolis, the ship will be anchored off the north coast of Santa Catarina Island. Guests will be taken ashore via ship's tender to the jetty at the Yacht Club. The center of Florianopolis is 12 miles or a 20-minute drive away. Taxis are available at one of the nearby resort hotels. 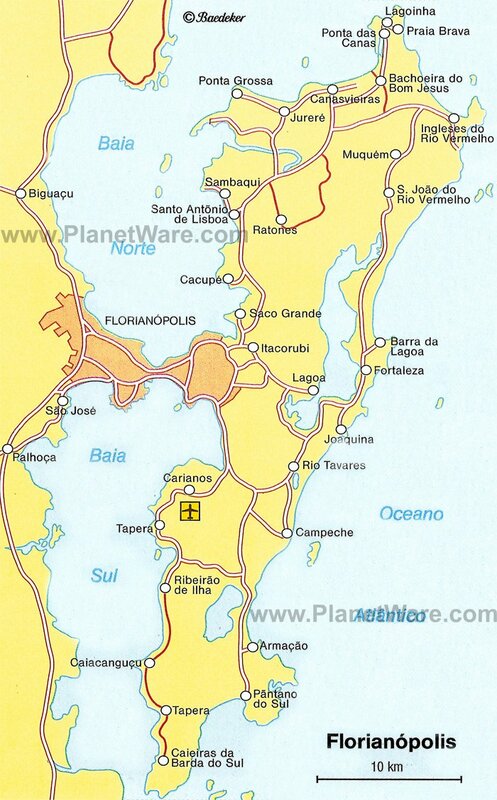 Florianopolis was founded in 1726 by immigrants from the Azores, along with German and Italian settlers. Located on Santa Catarina Island, which is joined to the mainland by three bridges, the late 19th century pastel-colored, plastered buildings still recall faint "old world" images. The natural beauty of the island, its beaches and bays make Florianopolis a popular tourist center. Most visitors head straight for the island's 42 beaches, with the best ones, found on the north and west coast along with fashionable resorts and some of the best hotel facilities in the country. From here you can also take a flight to see the dramatic Iguacu Falls. Florianopolis was named after Floriano Peixoto, former Brazilian President who defeated insurrection in the city in 1849. Among the city's historic buildings are three fortresses, the Jesuit Monastery and the 200-year-old Palacio Cruz e Souza, which houses the Historic Museum of Santa Catarina. The metropolitan cathedral stands at the highest point and overlooks the main square. The church features a life-size sculpture in wood of the flight into Egypt, originally from the Austrian Tyrol. Other attractions in the city include the Municipal Market and former Customs House, now converted to contain good craft stalls, art galleries and handicraft shops. In Florianópolis, a car is almost a must. You will get a lot more out of your visit with your own transportation, allowing you to explore and come and go as you please. Traffic is relaxed; speed limits and regulations strictly obeyed. Florianópolis is also extremely safe. You can safely park anywhere (though you should remove valuables from the car). Traffic can be very busy on weekends. The island of Santa Catarina has an efficient bus service (R$2). Buses for the east coast and south island (including Lagoa and Joaquina) depart from the local bus terminal on Rua Antônio Luz. Buses for the north depart from the local bus terminal on Rua Francisco Tolentino. Additional yellow microbuses (a little more expensive) follow the same routes: their advantages include air-conditioning, fewer stops and direct routes to the beaches. Most visitors head straight for the island's 42 beaches, with the best ones found on the north and west coasts along with fashionable resorts and some of the best hotel facilities in the country. Good shopping can be found in Florianopolis on Felipe Schmidt, an all-pedestrian street. Jurere Beach Resort features an Open-Air Shopping Center that is accessible from the jetty via a complimentary shopping shuttle by minivans offered by the merchants. Best items to shop for: local handicrafts and resort wear.